Chef Michel Richard, owner of Citronelle restaurant in downtown D.C., is known for his savory yet unfussy cuisine. But he started out as a pastry chef, and he has returned to his roots in this book of elaborate-looking but surprisingly simple desserts. The first recipe immediately caught my eye—and made my stomach growl. Richard explains how to make Coffee Créme Brulee without a blowtorch; you simply sprinkle the top with a cocoa and caramel powder that, once melted and then cooled, forms a light crust. Yes, please! My favorite dish of the year would have to be risotto, so I can’t wait to try out the Mulled Cider and Rum Risotto dish. The creamy and absorbent grain makes for a promising dessert. Speaking of grains, I’m also intrigued by the Flan with Automatic Crust, which uses a cup of Israeli couscous (pearl pasta). A very traditional French dessert, the Apple Compote Tart, sounds easy and delightful. Richard’s recipe for Chocolate Éclairs, another traditional French snack and one of my favorite desserts, tempts me to try out my new pastry skills, though I’m not as confident that they will turn out well. I once tried to make homemade cinnamon buns, and it took approximately two days. I was so hungry! And forlorn. After that, I was happy to stick to the Pillsbury pre-made rolls. But I’m hoping Richard’s Cinnabun recipe will erase the memory of those two terrible days. I love cheesecake, and I can’t wait to try the Lightened-Up Cheesecake with Cocoa Cranberry Topping. It requires no baking, and you don’t even need a springform pan. When “lightened-up” cheesecake is still too heavy, though, Richard recommends his Lemon Cheesecake Ice Cream—no ice cream maker necessary! This is an excellent dessert cookbook, just in time for the holidays! If I had to pick one technological advance that has revolutionized the chef’s craft, it would surely be the microwave oven. . . . I have found that so much of the time-consuming, pot-dirtying work in cooking can be done away with simply by using [it]. I appreciate the chef’s inventiveness and his willingness to incorporate nontraditional elements and techniques in his quest for efficiency and ease. I was particularly impressed by the value he places on flavor over sugar and fat. He constantly tries to improve flavor by limiting competing (and unhealthy) tastes. 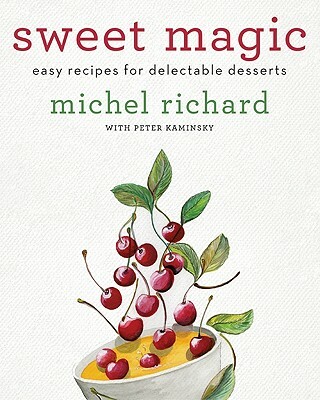 The strength of this book is that while Michel is permanently rooted in rigorous, classical French baking methods, he demystifies the “magic” behind desserts that look complicated. When I bake, I tend to find one recipe that I know works, and stick with it. Baking can be very complex, and, as Richard notes, a pastry chef can’t taste his dish and add seasoning midway through like a savory chef can. But Richard doesn’t rest on his laurels once he has found a good recipe; he constantly attempts to make that dessert better, tastier, and not quite so bad for you. Michel Richard exhibits playfulness and a true passion for taste, flavor, and texture; I found myself laughing at his anecdotes and making notes of his efficient shortcuts. What’s more, he has inspired me to stop playing it safe in the kitchen—the sign of a truly good cookbook!